Farmers purchase crop insurance out of their own pockets. On average, farmers spend $3.5 to $4 billion per year out for crop insurance coverage. Last year in Kentucky, farmers collectively paid $57 million for coverage. As is the case with other types of insurance, we must prove that we have met a deductible to be eligible for a payment for a portion of our loss. Because of the unique risks involved in farming, the federal government also provides support to reduce the cost to farmers. If we didn’t have this federal support, crop insurance would simply not be affordable most of America’s farmers and ranchers. I am fortunate to be the eighth generation of my family to farm in Larue County though I didn’t inherit family farm land. We purchased our farm more than a decade ago, basically starting from scratch. It hasn’t always been easy, but it is our way of life — our calling. Agriculture has always been the backbone of our country, and I would love for one or all three of my children to carry on this tradition. James C. Musser Musser is a Senior Fellow, Thomas Jefferson Institute for Public Policy. Previously he served at Special Advisor to the Chairman of the U.S. House Budget Committee and also Vice President at the Mercatus Center at George Mason University. It’s been a wet spring around my family’s farm. We’re about three weeks behind on planting and, like many of my neighbors in Magnolia, we’re hoping for continued warm weather. I love this time of the year. This is what it’s all about for a farmer — putting a seed in the ground and raising it all season for harvest. My family has been doing just that in this part of Kentucky for nine generations. At 31, I’m already a lifer. There’s nothing I’d rather be doing than growing soybeans, corn and winter wheat and raising pigs in a pretty part of the world. But, lately, the business of farming has been tough. I’m not the only one feeling the pressure. Nationally, farm incomes are down 50 percent compared to what they were five years ago. That’s put a pinch on everyone. Grain prices are down. So are beef, pork, poultry and milk. Couple all that with the fact that most of your farmland operations, on any scale, have substantial debt loads, and it’s easy to see how people are struggling in farm country. On the upside, we have a growing global population and I think the future is bright — especially if smart policy decisions are made in Washington. Congress currently is debating the Farm Bill, which is critical to how we plan and run our business. Crop insurance, which is part of the Farm Bill, has become the main way farms mitigate the risks of uncontrollable weather and unpredictable price swings. It has become the cornerstone of the American farm safety net. Crop insurance is a lot like life insurance. You don’t ever want to use it. But at the same time, it helps manage through a disaster and helps you stay in business. The last time we used crop insurance was the drought of 2012. Without it, we would have had a hard time planting our next crop. Most banks require it nowadays to get an operating loan at the start of the season. Crop insurance has changed a lot in recent years — offering dozens of policies and coverage options that are as unique as America’s farms. This ability to tailor coverage to fit your individual need and adapt to a changing market is one reason crop insurance has become so popular. Products such as Harvest Price Option give us modern tools to manage the risks of modern agriculture. HPO lets us forward market our crops. It protects revenue, not just yields, offering the equivalent of “replacement value” coverage on a car. As farmers, we’re willing to pay extra for the protection HPO offers because it gives you the faith you need to put your borrowed money in the ground and know you’ll be able to pay it back. I hope Congress will leave crop insurance alone in the Farm Bill. Without this essential risk-management tool, a lot of farmers are going to be left holding the bag. Without it, it is going to be hard to incentivize folks to put out crops and produce the food and fiber we need to feed and clothe the country. Cutting crop insurance would be like cutting the heart out of the heartland. That’s not just bad for farming; that’s bad for everyone. Caleb Ragland grows soybean, corn, winter wheat and raises pigs with his father and grandfather at Shady Rest Farm in Magnolia. He can be reached at shadyrest08@gmail.com. My family has been farming in south central Ohio for six generations. I’m proud of my heritage and I knew from a young age that there was nothing else I wanted to do. I was fortunate to be able to come back to the family farm after college at Ohio State University. I say I was fortunate because, honestly, it wasn’t a sure bet that I would have a chance to continue Metzger Family Farms. We grow soybeans, corn, wheat and just started a crop of malting barley to supply a new processing plant coming to the state. My family is excited about the future. But the recent past has been full of sacrifice for my uncles, cousins and my grandpa. When I was 5, on a July day in 1980, a storm tore through our community in Williamsport. The things I remember about that day are the memories of a child: My toy tractor blown down the road. The roof ripped off the house. The shop flattened. All of that could be repaired. But in our fields was a disaster that I’ve been dealing with now for my entire adult life. The storm was never officially classified as a tornado. But the hail and straight winds were just as destructive. The wheat, which had been ready to harvest, was flat. My family combined it and planted beans but, in the end, we basically had no crops to sell that year. We were left with three-quarters of a million dollars of debt. What followed was heartbreaking for my family. We had to sell two pieces of land and rent them back to stay in business. Fortunately, we were able to keep one as we started digging out of this tragic hole. And the digging took decades. We were able to buy one farm back in the late 1980s. We bought back half of the other one only three years ago. And 2 years ago – 36 years after that single storm in a single day back in 1980 – we bought back the other half of the farm we lost to pay our debts. Combine this with the terrible prices of the 1980s, and it was a time full of stress and sacrifice for my family. They worked harder than I ever have and probably ever will. Most people would have given up. But that was not them. Bankruptcy and walking away from our family’s farming heritage was not even a choice. Like many Americans, they used hard work and determination to rebuild. While the story is sad enough, there’s a tragic piece of irony to add. That year, back in 1980, a man came by the farm selling crop insurance. He was one of the first in our area to offer it. My family declined. We had never needed it before and didn’t see a reason to spend on it then. It’s easy to second guess your decisions in life. But there’s no use in that. If my family had it to do over again, we probably would have kept our land at all cost. And we most certainly would have purchased that crop insurance policy. Today, crop insurance is part of our business plan. We couldn’t get an operating loan without it. We wouldn’t be in business without it. Crop insurance has changed a lot since 1980. 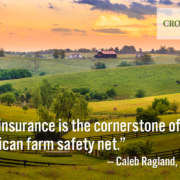 With products like Harvest Price Option, which allows farmers to insure revenue and not just yields, it’s no wonder crop insurance has become the cornerstone of the American farm safety net. HPO lets us forward contract and not be as concerned if we have a short crop in the summer and need to buy back contracts. It allows us to be more aggressive and get as much as we can for all the hard work and investment we make in our crops. While crop insurance has change a lot since the 1980s, prices haven’t. Net farm income is lower now than it was 5 years ago while input costs in fuel and labor are all up. That’s why it’s disappointing to hear some members of Congress call for cuts to crop insurance. If Congress eliminates products like Harvest Price Option, crop insurance won’t be as effective, and it will put a burden on farmers who are already burned with low incomes and falling prices. Without HPO, our farm would have taken another disastrous hit during the drought of 2012 just as we were seeing some light at the end of the tunnel. I’ve spent some time talking to members of Congress in my roles with the state and national soybean associations. I tell them not to mess with crop insurance. It’s working well. Farmers pay for it and it prevents costly disaster relief bills. As Congress debates the Farm Bill, I hope lawmakers will remember my family’s story and continue to support the modern crop insurance farmers have come to rely on. Scott Metzger farms with his family at Metzger Family Farms in Williamsport, Ohio. He is on the Ohio Soybean Association Board of Trustees and is a director with the American Soybean Association. It is no secret that we are experiencing hard times in farm country — here in Missouri and beyond. In addition to the typical weather rollercoaster, farmers are facing yet another year of low prices in the marketplace. Meanwhile, our input costs (farm equipment, fertilizer, land rent, etc.) remain the same. It doesn’t take a math whiz to see that the numbers just aren’t adding up for our nation’s farmers. As a lifelong farmer myself, I haven’t seen this kind of downturn since the farm crisis of the 1980s. Many of my fellow farmers I have spoken with have shared this same sentiment. It is concerning, to be sure. But thankfully, a few things have changed since then that puts us in a better position to weather this latest storm. One of the most important developments is the emergence of a strong crop insurance program. Crop insurance is a risk management tool that protects us against elements out of our control. It kicks in, for example, when we experience a loss of our crops due to natural disasters, or a loss of revenue due to market fluctuations. Crop insurance works a lot like auto insurance or homeowner’s insurance. Banks often require farmers to purchase it, just as they require insurance from homebuyers. Farmers spend between $3.5 billion and $4 billion a year to purchase crop insurance sold through private companies. Because of the unique risks involved in farming, the federal government also pitches in to reduce the cost to farmers. Without this federal support, crop insurance would not be affordable to a majority of America’s farmers and ranchers. With it, however, many farmers are able to plant another year. Crop insurance is especially critical for beginning farmers, who generally have less credit and capital. Going into farming these days is a daunting proposition all around, but crop insurance does provide some important peace of mind to both the young farmer making the investment and the banker making the loan. But it isn’t just farmers who benefit from a robust crop insurance program. Crop insurance is critical to the broader rural economy as a whole. It provides a backstop to the whole farm supply chain, and to our communities. A calamity on the farm doesn’t have to mean a calamity across the board. Taxpayers also benefit from a strong crop insurance program. In fact, before crop insurance was widely available like it is today, the cost of natural disasters fell directly on U.S. taxpayers by way of emergency legislation. Now, unlike many other industries, taxpayers aren’t on the hook for bailouts when the bottom falls out. I encourage our lawmakers in Washington to also keep this in mind as they develop the next Farm Bill, and urge them to work together preserve a strong crop insurance program. Afterall, as the famous saying goes, those who do not learn from history are doomed to repeat it. And that’s something none of us can afford. Dorian Culver is a soybean farmer and crop insurance agent from Harrisonville, Missouri.